Many people have not experienced IP games or have not played them due to the difficulty of joining a game. Well now thanks to RR_Lindow, there is a script called Outnet 2 to use with MIRC to host and join Outlaws IP games with ease. You can visit the authors pages to obtain additional information from here by using the Outnet's Home Page hyperlink. Outnet 2 is available for people that already use MIRC to chat with or play in the #Outlaws_Players channel on the Undernet. If you already have MIRC just download the script, extract it toyour MIRC directory, and load the script by typing /load -rs outnet.mrc. After it is loaded you can right click on the channel window or select Outnet from the Commands dropdown menu. 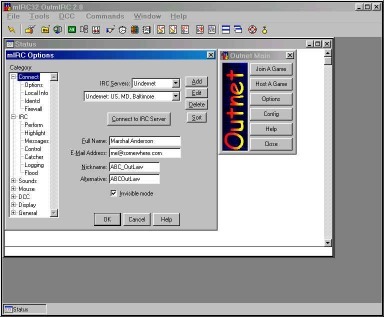 Configure Outnet by selecting the Outnet Config Button and entering the directory where Outlaws is installed and the nickname you wish to use in the games. 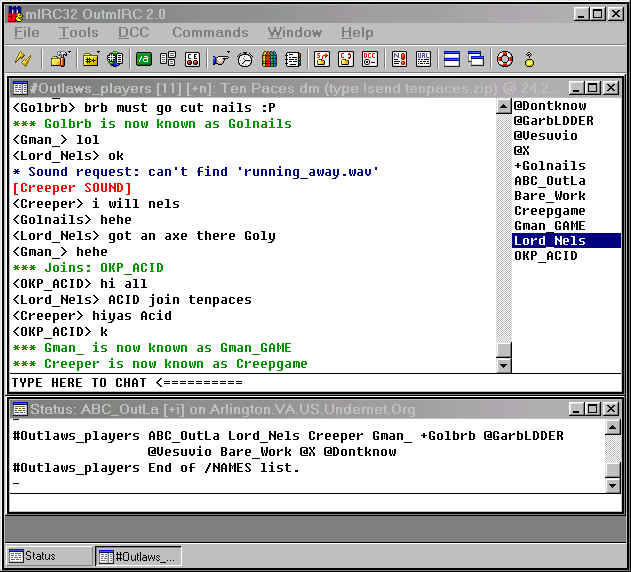 OutMirc was created to allow people that do not presently have mIRC chat software installed to join IRC and connect to IP games easily. OutMirc 2 is a self executable zip file that has mIRC and Outnet included in it. I have ran it through a couple of virus scanners for your protection so you don't have to worry. OutMirc is designed to where once it is installed and setup, it will take you directly to the #Outlaws Players Channel on the Undernet where you will find some of the friendliest Outlaws around and many fine shooters to test your skills. This software will allow Outlaws players to join the IRC channel automatically, launch and join games as easy as the Zone. The following will assist you in installing the software and I have included some screenshots to give you some visual help if you need it. Download the file by hitting the red icon above. 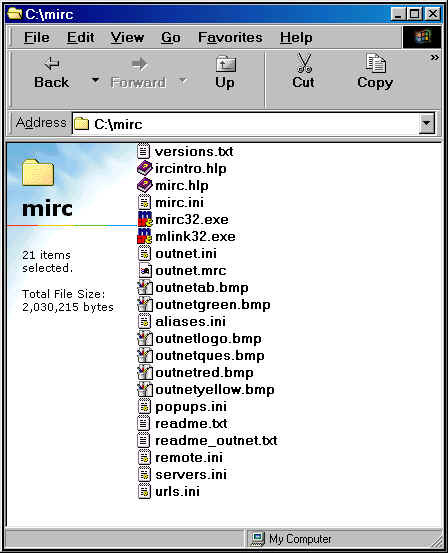 Once you have the file downloaded in a temp directory, just double click on the file called OutMirc2.exe (screenshot) and install it in a directory of your choice. It will then bring up a box where it will ask you what directory you would like to place the mIRC software files into, for this example I will use c:\mirc. (screenshot). 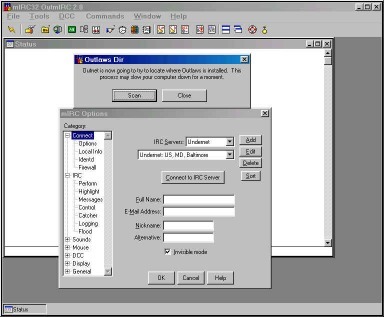 To start MIRC, just double click on the mirc32.exe file which you have installed in the C:\mirc directory (screenshot) and it will open the mIRC software. 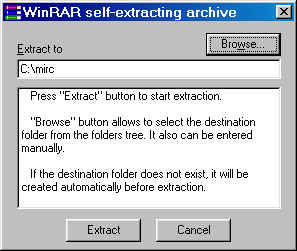 To make it easier to access the startup of mIRC just drag the mirc32.exe file onto your desktop to create a shortcut. When you have double clicked on the mirc32.exe or the shortcut a box will popup stating "Outmirc is now going to try to locate the directory the Outlaws is installed in. (screenshot) Just press the scan button and it will find the Outlaws directory automatically for you. Then hit the button Use This Dir or enter the Outlaws directory manually. Now it is time to set up Outnet. You will see two boxes. One called Outnet Main and the other called Outnet Options. Select the Outnet Options box so to activate the box and enter the information required. 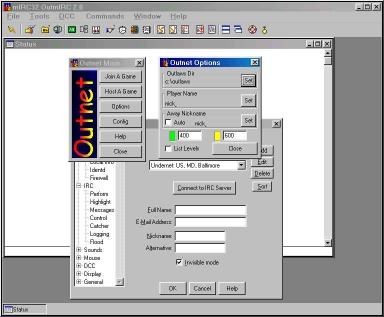 (screenshot) If for some reason you loose the Outnet Options box just go to the commands menu at the top of MIRC and select Run Outnet and the Outnet Main will pop up and then select Options in the Outnet Main. Under "Player Name" enter the nickname you wish to use and hit the set button. Then set your away nickname and check the List Levels to have Outnet show what levels you have available in Outlaws when hosting a game. Then hit the close button. Now its time for the mIRC setup. Enter whatever name you wish in the top box, email address and the nickname you would like to use in mIRC and a alternate nick. You can enter a maximum of 9 characters on your nick name. Then hit the OK button. (screenshot) If someone else in on MIRC with the same nickname you will need to change yours to something else or MIRC will not let you connect to the server. If this happens just type /nick newnick (your new nickname) in the bottom of the status window when attempting to connect to the server. To connect to the IRC server, at the top of mIRC you will see a tool bar with a broken lightning bolt icon on the far left side. Click on that and you will then connect to the server and join the #Outlaws_Players channel where we chat and play the Outlaws game. Walla! You now have joined the channel where we play. (screenshot) The people that have the @ sign in front of their nicknames are the channel operators which uphold the law in the channel. The Outlaws_Players channel is a family oriented chat room for all ages to enjoy. We do not allow cussing, extreme rudeness, discussion of drug related topics, racial or sexual harassment in the channel. Now you have MIRC up and running and have joined us in the channel please feel free to join in the chat, ask questions, play outlaws, join the ladder and play in the tournament. If you need assistance in running Outnet you can look at the help area in Outnet or ask anyone in the channel. mIRC help can be found in the program under the help menu. Good luck!